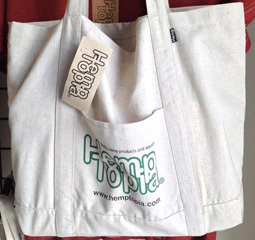 The “Grocer” hemp bag is made from 100% recycled material and features our original Hemptopia logo. This bag is larger than our Farmer bag and is made from 35% recycled hemp, 35% recycled cotton and 30% recycled polyester. The bag features a pocket on the outside to hold keys and other small items. A one piece wrap-around handle adds strength and durability for holding your heavier items. Hemp fabric is naturally antimicrobial: Hemp has small air pockets within the fiber which allow more air to pass through allowing the fiber to breath better, thus not allowing bacteria and mold to grow. Hemp is sustainable and environmentally-friendly: Hemp is a naturally organic, chemical-free and environmentally friendly fiber. Hemp can be grown using little to no pesticides or insecticides, and also does not require any herbicide.